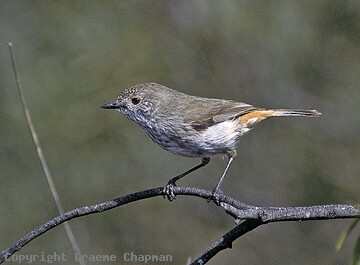 Inland Thornbills are the Brown Thornbills of the inland - indeed they are still regarded as a single species by some people, because there are areas of overlap such as eastern S.A., the Big Desert in Victoria and up the western slopes of the Gt Dividing Ra to near Tenterfield, where apparent intermediates occur. Inland Thornbills are usually much more heavily streaked on the breast than Brown Thornbills but the more reliable field mark is the width of the dark tail band, much broader on an Inland (see pics 476210D and 475216D). There is a fair bit of variation in the different subspecies of Inland Thornbills, the most extreme of the being a very pale bird ( in What Bird is That? known as the Whitlock Thornbill.) When I first encountered a "Whitlock" Thornbill, it was in a melaleuca scrub on Anna Plains station, south of Broome, a very long way north in Australia for a thornbill. Well worth photographing, a very distinctive form, but I still haven't managed that. 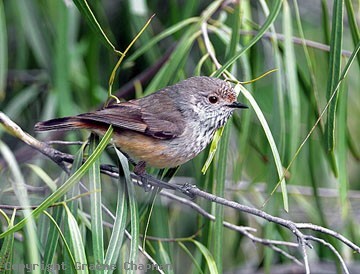 476201 ... Inland Thornbill, subsp. albiventris, Round Hill N.S.W. a heavily striated individual. 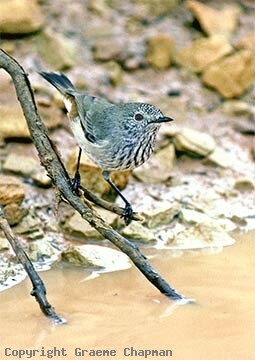 476202 ... Inland Thornbill, Round Hill, NSW. 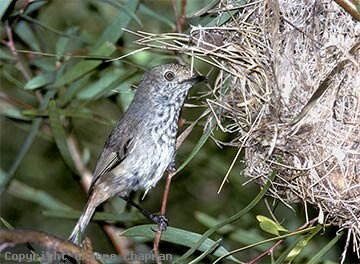 476203 ... Inland (Broad-tailed) Thornbill, subsp, apicalis, Perth, W.A. 476206-D ... Inland Thornbill, Round Hill, N.S.W.